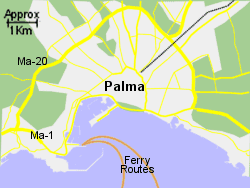 Map of the Palma Ferry Port area. Palma de Mallorca Ferry Port is located on the south western side of the city, giving excellent views of the cathedral as the ferry pulls away. This busy port has good connections to major roads radiating out from the city and bus services are available. One bus service in particular runs between the port and the airport, via the city, approximately every 15 minutes. The city also has a small metro train system which runs from the city centre to the university. The nearest station to the ferryport is a distance of 3 to 4 Km. Operated by Balearia, up to 3 crossings per week, crossing time 3 hrs. Also operated by Acciona with 1 crossings per week, crossing time 4 hrs. Operated by Acciona, 1 crossing per week, crossing time 6 hrs. 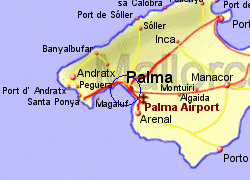 Operated by Balearia with up to 7, crossing time 7.25 hrs. Also operated by Acciona, with up to 6 crossings per week, crossing time 7.5 hrs. 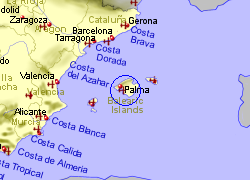 Operated by Balearia with up to 7, crossing time 8 hrs. Also operated by Acciona with up to 6 crossings per week, crossing time 8 hrs. Operated by Balearia with up to 7 crossings per week, crossing time 8 hrs.